Leaving the aire at Vera, we headed to the coast through scruffy farmland, passing through the small resort of Villaricos and the busier port of Aguilas. 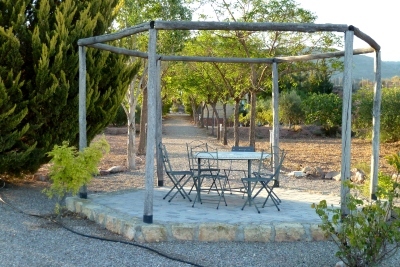 After lunch by a lagoon at Cabo Cope, we took the winding main road over the hills to the very small beachside village of Calnegre, and another private aire with only two other motorhomes, but with room for forty, and apparently busier in the winter season. The next morning we decided to head inland, (missing the seaside resorts of Bolnuevo and Bahia, which we discovered later were more attractive), passing a police radar speed trap just before Mazarron. 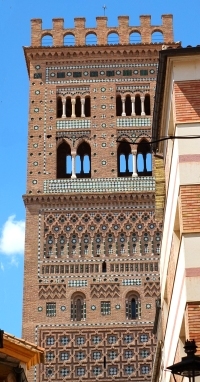 We then drove along the empty RM3 Autovia, passing several urbanisations on the hillsides, to Alhama de Murcia, an everyday shopping town, and took a narrow road through the wooded hills of the Sierra de Espuña Natural Park. After stopping at a viewpoint for lunch we reached a junction and took the slightly wider righthand road which led us back to Alhama, and picked up the straight main road to Totana and another excellent private aire to the north of the town, where we were the only motorhome staying for the night. We both felt we had seen enough of southern Spain, so rather than continuing east along the coast, we headed north on new and empty autovias. The countryside now became more attractive with fields of soft fruit. 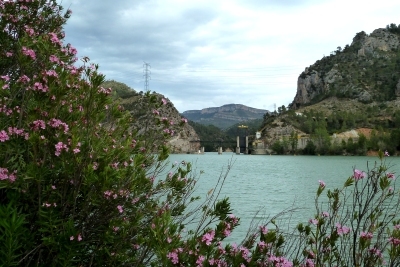 After bypassing Almansa with its large castle, we drove north on a good main road to reach a hilly region and the Riu Cantaban valley, and passing a nuclear power station turned off at Cofrentes to look at the large reservoir and rugged gorges of the Riu Xúquer. The road stopped at a dam where boat trips up the river were running, but we just missed the afternoon departure. There was a motorhome parking place listed at a picnic site but as it was deserted, we drove back to the free aire at Jalance, where there were a couple of vans already parked for the night. 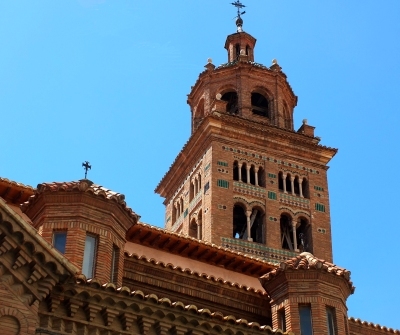 We continued north over wooded hills to the flat plains around Requena, then passed the amazing hilltop town of Ademuz, and followed another small river through pretty woods with distinctive red rocks to reach the larger town of Teruel, luckily on a Sunday so not busy. 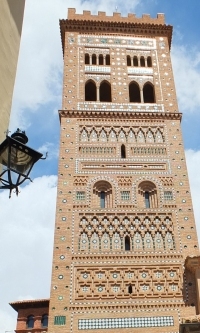 We parked at the station and walked up to the old town through with its distinctive red brick towers and monuments. 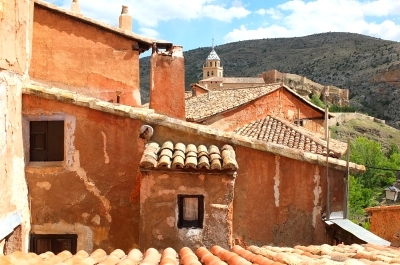 From there we drove over the hills to the red ochre coloured old town of Albarracin, a major tourist site surrounded by high cliffs, and checked into the ACSI CC listed municipal campsite. This was the first busy site we had stayed at and the pitches between the trees were rather narrow, but it was conveniently located near the town centre. 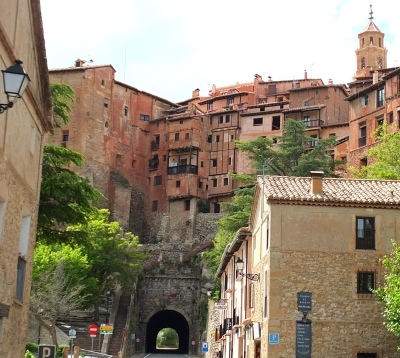 We had an enjoyable walk around the narrow lanes of the town to the castle ramparts stretching up the hillside. The next morning we drove north, and diverted to look at the large shallow lagoon at Gallocanta, renowned for birdwatching, but there was limited roadside access, and the interpretation centre was closed on a Monday. 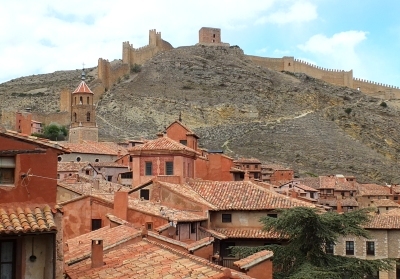 We continued to Daroca, an old town with cobbled streets and over one hundred towers in its walls, but couldn't find anywhere to park so we changed our plans as usual, and drove on a mixture of narrow roads and autovias with lots of lorries. 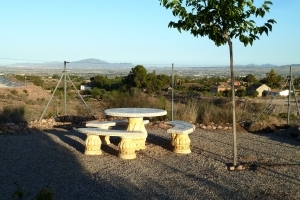 Skirting the northern edge of the Sierra del Moncayo, we reached the small town of Cascante, where there was an aire outside the sports centre. We were surprised when another motorhome arrived and they set up a cage for about ten small dogs. Luckily they were quiet overnight. Leaving the town we came across a large reclamation yard with some fine vintage steam rollers and tractors. The desert area of the Bardenas Reales was nearby so we diverted on back roads, passing rice fields then sandy rocks, to the viewpoint at the monastery of the Virgin del Yugo, which we had visited several years ago. After lunch and a walk to the viewing platform we rejoined the main road to Taffalla, then took a minor road to the small hillside town of Mendigorria, where there was a pleasant ACSI campsite by the river. As we had driven over 500 miles over the last couple of days we decided to stay put for a day, and the site had good facilities including free wifi that worked! The old town was worth exploring with a large church surrounded by narrow streets, and a leafy terrace overlooking the fertile countryside. 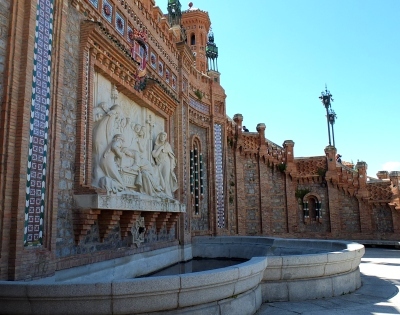 The next morning it was a short distance to the busy Pamplona ring road, then an easy drive up over the Col d'Ibañeta, with many pilgrims cycling through the drizzle, and into France and St Jean Pied de Port, busy with Camino pilgrims.